Thirteen-year-old Kiara MacLean is my new definition of cool. Have you heard of Sprocket & Steel yet? If not, you’re missing out, my friends. 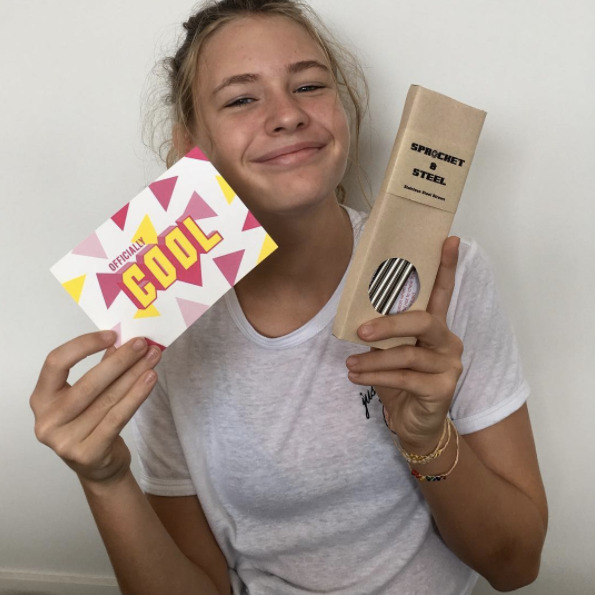 Kiara makes and sells stainless steel straws online and in several conscious little cafes around Newcastle. Inspired by a documentary she watched about the way plastic has polluted our oceans, Kiara decided enough was enough, and wanted to do her bit for the planet. Earlier in the year on the finals day of Surfest, the ladies at @merewetherbeachclean organised a clean-up that counted 172 plastic straws hanging out on the sand. And that’s just in one hour! I recently went to see ‘A Plastic Ocean’ at the Glendale Event cinemas screening and it was incredible to see so many cool and environmentally conscious people gathered to chat about our options for reducing plastic in Newcastle and The Hunter. Boomerang Bags had a representative (check them out, seriously!) as well as Take 3 For The Sea, selling stainless steel bottles, bamboo toothbrushes, reusable coffee cups and the like. The ‘Great Pacific Garbage Patch’, as its commonly known, spans waters from the west coast of the USA to Japan and is made up of non-biodegradable trash materials. Most of it plastic, which breaks down into tinier and tinier pieces called microplastics. And that’s not including the junk that floats to the bottom of the sea. It’s all pretty heartbreaking stuff. A stainless steel straw from Sprocket & Steel will set you back about $6 each AND you can choose from standard, smoothie (you know, so you can actually get that deliciousness in your mouth, amirite?!) or cocktail straws. Plus if you buy them online in sets, you can grab cute-as handmade felt pouch. In between making steel straws and saving the world one less piece of plastic at a time, Kiara somehow fits in school, homework, and hanging out with her friends at the beach, Rascal Burgers and Popolo Gelateria. Find Sprocket & Steel straws at Scoop Wholefoods, Pickled & Pressed, Momo Wholefoods, The Bondwood and the Olive Tree Markets. How did you come up with the name Sprocket & Steel? It’s a combination of ‘sprocket’ for the vintage Honda motor bikes my mum’s partner rebuilds, the steel furniture he builds, and my steel straws. When did you come up with the idea of making stainless steel straws? A couple of years ago I saw a documentary about the Great Pacific garbage patch that was discovered in the Pacific Ocean. It made me so sad to see turtles and other animals dying from eating plastic straws. I decided to start my own business to make stainless steel straws to help save the animals, and share them with everyone. If everyone in Newcastle, for example, had one Sprocket & Steel straw, there would be no need for the pesky plastic kind! My ideal world would be one where people are environmentally conscious and have a home veggie garden. People would be well-fed and not go hungry, countries would be at peace… and less homework, too! My friends – they make me laugh and I love hanging out with them. My second cousin Jes from [Newcastle-based linen and lifestyle brand] Dazed But Amazed is really cool. And Alessandra from Merewether Beach Clean. My family and I help her clean up the beach on weekends and special events.